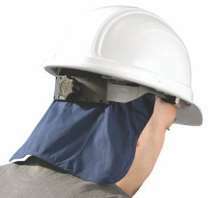 The same easy to insert top of head cooling effect as our popular MiraCool Hard Hat Pad #968 with the added benefit of a sun protecting neck shade. With 900,000 new cases of skin cancer resulting in approximately 9,700 deaths annually, your workers will appreciate the lightweight cotton neck shade. Available in Navy. The head has many blood vessels close to the skin which influence body temperature.